The Saigon River twists and turns, skyscrapers hug the clouds and scooters swarm along roads lined with makeshift cafés. There are elegant tree-lined streets – part of the city’s French colonial heritage – but modern hotels are springing up everywhere, joining older landmarks like the Rex, where war correspondents once drank highballs on the roof terrace. Ho Chi Minh City is the start or finish point for many Mekong river cruises, while a small number of ocean ships make it here from the South China Sea. And while the horrors of the Vietnam War still loom large in museums, posters and statues, today’s Vietnam seems to be the world’s happiest communist country, blending old and new in a pulsating whirl of colour. Leave your ship and head for the cool, modern Liberty Central Saigon Citypoint Hotel. The 19th floor rooftop pool is the place to be seen and to savour views over the futuristic skyline, incongruous against the Saigon River. Visit the Reunification Palace (also called Independence Palace), set in lush grounds with fountains, where the two halves of the country were reunited on 30 April 1975, at the end of the war. Designed as South Vietnam’s presidential palace, it’s as magnificent a piece of 1960s architecture as you’ll find anywhere. Don’t miss the subterranean war room with its secret escape route to the helicopter pad outside, and look out for the iconic photo depicting the fall of the South, with a tank crashing through the gates. Now head for the War Remnants Museum. The outdoor collection of abandoned US tanks and aircraft pales into insignificance against the hundreds of war photographers’ images showing the scale of destruction wrought by US carpet bombing, and the infamous use of napalm and the defoliant Agent Orange, which led to devastating health problems for those on both sides – and their children – for decades to follow. It’s moving, disturbing but a must-see. The late 1800s was a busy time in the city then known as Saigon. Dating from then is the charming twin-towered Notre Dame cathedral, built of bricks brought over from France. Across the road is Saigon Central Post Office – an edifice of the size and grandeur usually reserved for railway stations (it’s the work of Gustave Eiffel, he of tower fame). Inside you’ll find huge paintings, vintage stamps for sale, and ornate wooden phone boxes that now house ATMs. Down the street is the equally grand Opera House, also by Eiffel, and the former Hotel de Ville (based on a Parisian original), which is now home to Ho Chi Minh City People’s Committee. Illuminated at night, it’s an impressive sight from the terrace of the Rex across the road. Wander back to the Citypoint Hotel via Nguyen Hue, a grand, straight street with a central walkway and a statue of Vietnam’s saviour, Ho Chi Minh himself. Refresh yourself with a few gentle lengths in the pool before freshening up for dinner and treating yourself to a sunset cocktail in the open-air bar. Set off for Cu Chi tunnels, the famed underground hideout of Viet Cong fighters during the Vietnam War. It’s an unmissable sight, but one that takes up half the day, so it pays to make a prompt start. You can either book a bus tour or take the Saigon River Tours speedboat all the way – about 45 miles – from the heart of HCMC. Walking the trails through the tropical forest today, it’s hard to comprehend the horror of what went on here during that terrible conflict little more than 50 years ago. But this 150-mile network of tunnels, with its tiny openings, was home to some 2,000 people. Rooms were excavated on three levels but access often involved slithering along. Try crawling 50 yards through a tiny space and you’ll find the experience would have your hair standing on end if it weren’t dripping with sweat. There’s the opportunity to go further if you want to, but few do. Instead you can watch black-and-white films of the fighting, see the rusting remains of a tank that was destroyed by a mine, gasp at the mantraps constructed from all manner of metal and bamboo spikes, and there’s even the chance to fire a machine gun (£2 a bullet). Fortunately there is also an open-air riverside restaurant, where you can regain your equilibrium. You’re back in the city now, and after your subterranean adventure it’s time to get your head in the clouds at the Bitexco Financial Tower – a futuristic glass design with a 49th-floor observation lounge. Not far away is Landmark 81, which recently snatched Bitexco’s title as the city’s (and the world’s 14th) tallest skyscraper. It has a viewing deck on the 79th of its 81 floors. Either way, you’ll see the river disappearing to the coast, a few miles away, and into the lush interior. You can dine here, too – Landmark has a restaurant and Sky Bar on floors 66 and 67, while Bitexco offers the Eon51 51st-floor restaurant and HeliBar, both of which glow green above the city as night falls. And with cocktails costing as much as entry to the observation lounge, why not admire the view with a drink in hand? Have breakfast at Banh Mi Hoa Ma, one of the city’s oldest bakeries, which is famous for creating crusty, melt-in-the-mouth mini baguettes. 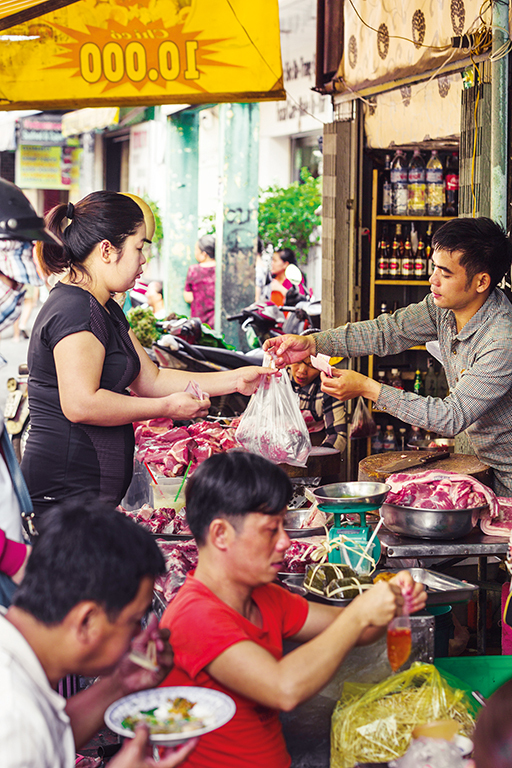 The place itself (on Cao Thang, a brisk stroll from the Citypoint Hotel) is little more than a corner shopfront, with tiny tables and stools lining a moped-thronged alley. Marvel as staff safely deliver fried eggs and ham in skillets, effortlessly avoiding bikes and cars. Give the youngsters a pad and pen and let them tally the number of mopeds that buzz past their ears during the course of a meal. Saigon Zoo and Botanic Gardens is a delightful family meeting place, particularly on a weekend. Set among towering century-old trees and gorgeous flowers are free attractions (junior fairground rides, a tempting paddling pool with slides) and the animal enclosures. Yes, you’ll feel that the gorgeous white tigers, elephants and orangutans are confined in too-small quarters, but there’s a undeniable run-down Victorian charm to the place. It’s inexpensive, too – less than £1.50 per adult and £1 for youngsters. Children, both locals and visitors, adore the open-air platform at the back of the new Saigon Waterbus. There are plenty of stops along its six-mile route, so it’s easy to hop off and explore, but many passengers are simply along for the ride, soaking up the scenery – the glassy tower of Landmark 81 and its surrounding sea of balconied apartment buildings, the shack restaurants, the serene solo fishermen, the swathes of water hyacinths and the little Bin Quoi car (and moped) ferry. And it’s another very cheap attraction, at just 50p a hop or £1 for the complete return trip. 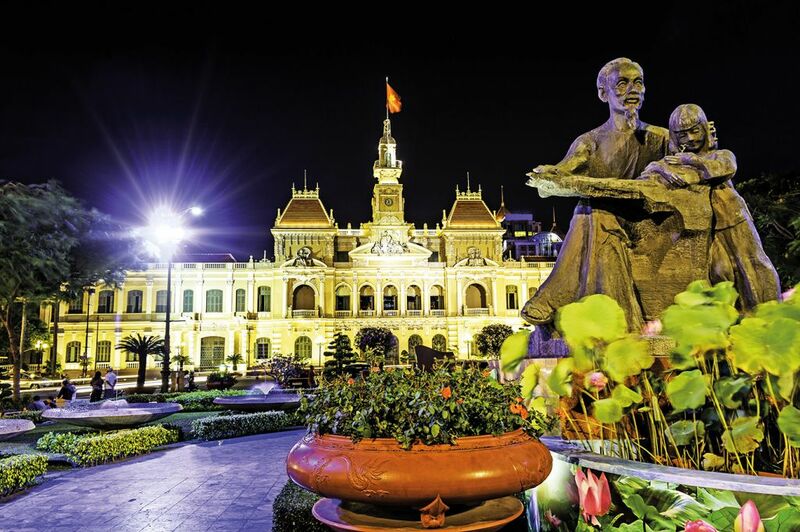 You’ll love a leisurely evening stroll along Nguyen Hue, ‘the walking street’. There are always lots of children playing in the safe, park-like setting, and often groups celebrating or taking jolly selfies in front of the Ho Chi Minh statue. And then, if you’re lucky enough to be staying at the Citypoint, you’ve got that fabulous hotel pool for a splash before bed.